Mary Armstrong’s diaries are a window into the daily life of a middle-class woman in a new and changing land, and a revealing account of life in early Toronto just before and after confederation. Her journals are one of very few published by Canadian women, especially women outside the upper classes, in the decades surrounding the mid-nineteenth century. Mary Armstrong was the wife of a butcher / farmer who lived in what is now the Yorkville and Deer Park area of Toronto from the 1830s to the 1880s. She had immigrated with her parents and siblings from England in 1834. Her diaries, which cover five months in 1859 and eight months in 1869, reflect her multiplicity of interests and concerns including family, women’s work, faith, status and class, occupation and trade, community networks, and local and national identity. Jackson W. Armstrong’s introduction examines who Mary was, what her world was like, and how she saw her own place in it; it also explains the origin and history of the diaries. His extensive primary research supports the well-annotated diaries, and gives contextual information on the events, people, and places that Mary mentions. 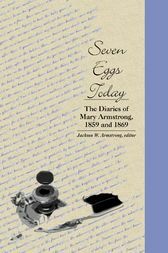 Seven Eggs Today offers new information and a new perspective on mid-Victorian English Canada, and will be welcomed by general readers and scholars interested in colonial life, biography, immigrant experiences, family or local history, or women’s studies. "Both text and commentary are a worthwhile contribution to the publisher's Life Writing series."